TP@Photoskiasi.com (Homepage) wrote: Faboulus scene Paolo. krusaf (Homepage) wrote: Very nice composition ! Clarity (Homepage) wrote: It's so crusty and self-contained, then the flowers break it up and make it charming. Like a rough voiced person with a soft heart. oldshutterhand (Homepage) wrote: Good contrast between the grey walls and the flowers. Old and new, dead and alive. Marc (Homepage) wrote: Great framing, it does make those buildings very tall ! sherri (Homepage) wrote: I love this. The scene, the crop...it's charming. Andy (Homepage) wrote: What an amazing building this is! Great shot! Terry H. (Homepage) wrote: Very beautiful and the flower boxes are awesome! 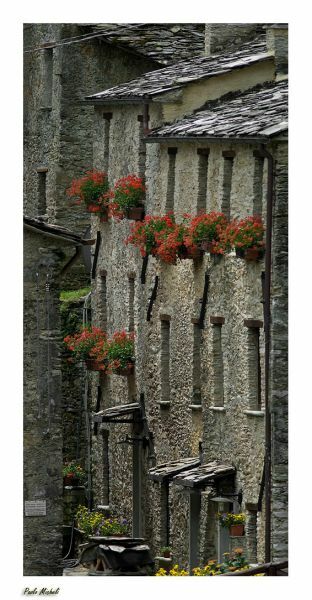 BoB (Homepage) wrote: fantastico il contrasto tra le case in grigia pietra e il rosso intenso dei fiori alle finestre. Laurie (Homepage) wrote: This is a beautiful image. Love the colorful window boxes. Great angles. Frida (Homepage) wrote: Beautiful framing and subject. Lovely with the flowerpots against the stonehouses. beanow (Homepage) wrote: I like framed and the format of the picture very much. alexandra (Homepage) wrote: What a beautiful rustic view, a slice of visual history! grant (Homepage) wrote: excellent - the tight frame works well. Paolo (Homepage) wrote: bella, un po' come le mie di grado, anche se le mie sono origini "putative"